June 2006 - New web shipmates added in June - Delasco, Michael; Stiehl, Christopher; Reed, Fred; Milheiser, James; Duell, William; Bratcher, Roy "Bratch". Check the Crew List for details. June 24 - On a sad note, we received an e-mail from John Glover that his father Roddy Glover, TM1 on the commissioning crew, had died in May of 1999. If any of you remember Roddy and would like to drop his son an e-mail, just drop me one at ssbn657@comcast.net and I'll forward it to you. 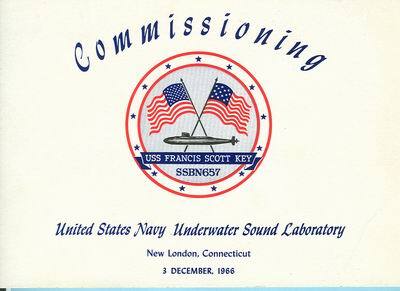 June 8, 2006 - A letter from Key shipmate Tom Conlon regarding the upcoming USSVI election. Tom is running for re-election as National Commander and asks for members support. Click here for Tom's Letter. June 7, 2007 - Check out the new SUB HUMOR page. I'm still laughing. Hi guys. This is Russ Christie MT1, Blue crew, 1970 - 1975. Today I am assuming the responsibility of maintaining the KEY web site from Al Singleman. (There will be no formal change of command ceremony so don't go looking for that moth eaten uniform). Al has been maintaining the site as best he could with the time he had available from its inception. I have had some experience with web site maintenance, so at the last reunion (after a few drinks) I volunteered to help with the site. The last time I volunteered for anything, it cost me 7 patrols and an overhaul. To improve the site, I will need your help. Send in your sea stories, pictures, suggestions and anything you think would be of interest to your shipmates. Also, think about joining the KEY Reunion Association; and be sure to shop at the KEY Ship's Store. This is how your web site is supported. CREW LIST: I improved the Crew List by leaving off the e-mail address and street address, phone number for privacy reasons, but will make that info available to other Crew Members who wish to make contact on request. I also added some more info to the list such as blue or gold crew and Division - these will allow you to be able to sort the list to show the shipmates that served during your years aboard. July 2006 - New web shipmates added in July. Falls, Jerry; *Moore, Raymond, Miskowski, Mike; Tremaine, Charles; Coatney, Jim; *Medeiros, Alfred; Meade, Ron; Osborne, Julian; Reistle, John; *McLeod, Mason; Cotton, James. Check the Crew List for details. July 21, 2006 - We have created a new section called Key Papers. These are the bits of paper that ruled most of our lives onboard Key. Take a look and send any documents that you might have held onto all these years. Qual cards would be neat to have online. July 17, 2006 - Did you know that a former Key shipmate has made it to the upper most echelons of military command? Admiral Edmund Giambastiani, current Vice Chairman of the Joint Chiefs of Staff was once the Chief Engineer on the Key. Click on his name to read his story. I wonder if he could get us the Key's sail for a memorial? August 2006 - New web shipmates added in August. Holiman, Norman; Mercer, Chuck; Elger, Al; *Swanson, Theodore. Check the Crew List for details. August 19, 2006 - Another new area - Awards. The Key was awarded one NUC and one MUC during its years of service. Read about them by clicking on Awards on the left side of this page. August 13, 2006 - We have created a new area - Overhauls - dealing with the overhaul periods that the Key went through. Our thanks to Jeff Buss for the tremendous amount of material he provided dealing with the overhaul in Newport News from 1982 - 1985. Be sure to check it out along with the new pictures in the 1980's area. August 3, 2006. I found an interesting web site created by the Smithsonian Museum called Fast Attacks and Boomers. Click to check it out. They have an exhibit at the National Museum of American History. If anyone has seen the exhibit in the museum, please e-mail us what you thought of it. August 1, 2006 - There are Key shipmates that are still on active duty. I have denoted their names on the crew list in bold letters. If you are on active duty, please update your status by using the form on the Crew List page and putting "Active Duty" in the comments section. September 2006 - New web shipmates added in September. Johnson, Jeff; Sturgis, David; Chapman, James; Parker, Terry; Mileur, James; Kennedy, Jared; Houston, Chris; Waltz, Robert; Hart, Arthur; Miskell, William; Mason, Rich. Check Crew List for details. September 19, 2006 - The Awards area has been completed with the addition of the Navy Unit Commendation awarded to the Blue and Gold crews for the Trident I conversion. There are some fine photos and even a movie of the launch. Check it out. September, 2006 - "Who are those guys?" Butch said to Sundance and we wonder too. Who are the shipmates and events in these pictures? Can you help identify them and when they were taken and what was going on. All are from the 1977 - 1980 era, we think. Many have already been identified but some are still waiting for the right set of eyes. October 2006 - New web shipmates added in October. *Mustin, James; Samuel, Michael; Saladine, Todd (active duty-SSBN 740); Carstaires, John; Newman, Kim; Carr, John. Check Crew List for details. October 20, 2006 - I have been contacting as many former Key Commanding Officers as I can find and asking them to write a brief history of their days as CO. CAPT Tim France - Gold Crew 84 - 88 has just completed writing his history. You can view it by clicking on COs, then clicking on his name. It is fascinating reading. October 19, 2006 - I found a couple of favorite recipes that will bring a smile and some memories of middle level ops on a Sunday morning. Check out the new Crews Mess area. 10/22/06 Update: I tried to make S.O.S. - read about it in Crews Mess. Now I know why they call it crews mess. October 17, 2006 - We have just been notified of the passing of shipmate Terry McNinch. He passed away on Sunday Oct 15, 2006 from a heart attack. A memorial service is being held on Oct 18 in Stafford, VA, then Terry's cremated remains will be interred in Arlington National Cemetery in about 6 weeks. See Eternal Patrol page for more info. October 9, 2006 - Some new pictures of Key and crew during its first sea trials in St Croix and Puerto Rico in 1967 as well as pictures of Key departing Charleston on Patrol #1. We want to thank plank owner Charlie Burrow TM2 Blue Crew for these great pictures. Just click on 1960's to see them. Also, Charlie has some unique documents and souvenirs that I added to Key Papers area with more to come soon. October 1, 2006 - Who was your Commanding Officer on the Key? I am trying to compile a list of all the men who served as CO. Check out this list. If your CO is not there, please e-mail his name and years served to me at ssbn657@comcast.net. 10/18/06 - Still need help on some early gold crew COs.
November 2006 - New web shipmates added in November. Macchiarella, Tony; Berkeihiser, Clay; Finch, David; Lee, Thomas; Gomez, Robert. Check Crew List for details. Nov 11, 2006 - Have a good Veteran's Day guys and wear your Key hats proudly. You earned it. December 2006 - New web shipmates added in December. Judd, Brian 79-82; Kielion, Larry 75-79; Arias, William 86-90 Active Duty; Solberg, Gregg 72-78; Harris, Ralph COB 70 -75; Mccoy, Wesley 88-92; Thomas, Carl 73-75; Krieger, Kenneth 80-83, Jones, Robert 79-81; Fleming, Glenn 79-81; Hanley, William 84-87; Hammond, Will 77-79. Check Crew List for details. Dec 28, 2006 - Just received the first issue of the "Garboon Tribune" gold crew ship's newspaper from 1974. It is in the Key Papers area. Check it out. Dec 27, 2006 - We recently received about 300 photos, papers, etc from Jamie Briggs that we will be adding to the site over the next few weeks so stay tuned. They are from the KeyGold web site that Jamie shut down about 6 months ago. Lots of good stuff on the way. Dec 23, 2006 - Got this card from Harry Baker, an MT from the early 70's. Harry got this from a friend and asked that I share it with all of you. It is an example of the cards that the current crews are getting. Brings back memories. 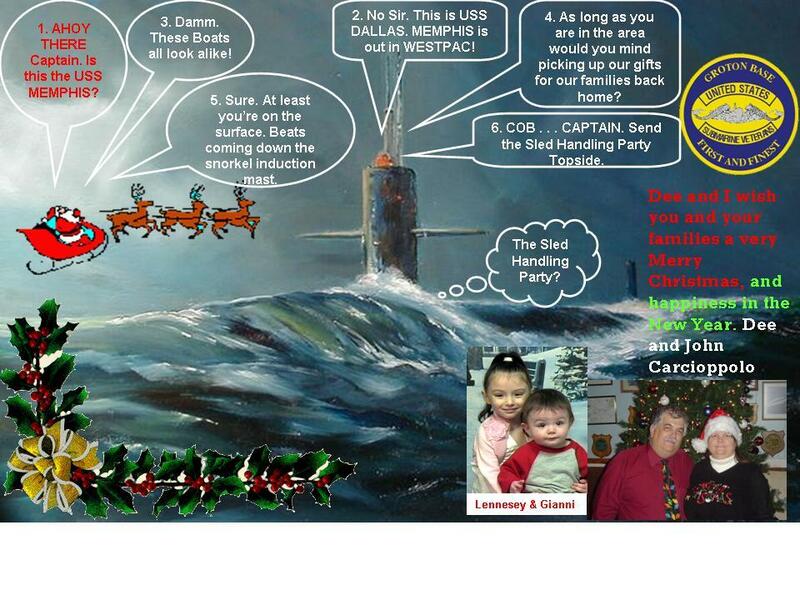 Dec 22, 2006 - A Merry Christmas wish to all the former Key shipmates and a big thank you to all the crew members that have submitted material to help build this web site into a living history of the crew of the Francis Scott Key. On Christmas morning be sure to take a moment to remember the submariners who are on patrol today and also remember our shipmates on eternal patrol. Dec 12, 2006 - 35 years ago Larry Cole, MM2 Gold Crew passed away, the only person to die onboard the Key. 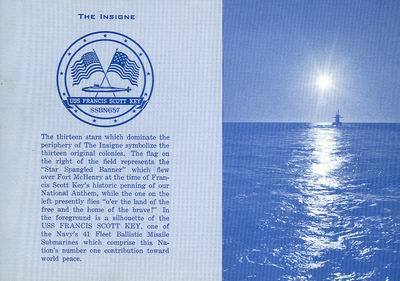 Jerry Falls, Quartermaster on the Gold Crew recently wrote a brief description of the events of that tragic day. You can read them in Eternal Patrol. Dec 4, 2006 - Here is a Key tidbit submitted by Thomas Lee, MT2 in the late 70s. Malcolm Wright, Key XO he thinks under CDR Hastie 75 - 78, was a technical advisor for the movie Crimson Tide. 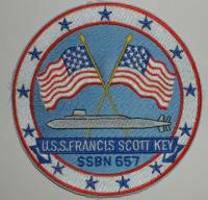 Dec 3, 2006 - Today is the 40th anniversary of the commissioning of the USS Francis Scott Key.